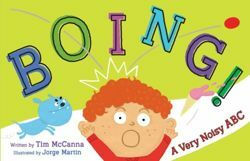 In this onomatopoeia-filled alphabet adventure, Xavier follows a bouncing ball as it wreaks havoc through the city. "Much to point and giggle at...Be ready for some rousing read-alouds!" -Kirkus Reviews Xavier follows a bouncing ball on an onomatopoeia-filled alphabet adventure in this quirky new picture book from Tim McCanna!A great, big AH-CHOO! sends a Xavier's bouncy ball flying! With a BOP! BIFF! BOOM! it sails out the window. Then a CLASH CLANK! DINK! DONK! That ball is loooooong gone. Will Xavier get it back? Follow the letters of the alphabet as the ball bounces and wreaks havoc through the city and find out!